Charity and the JAMband have won awards and acclaim for their cds. Now you can get a free song download each month. 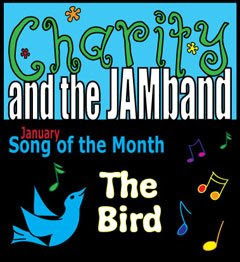 This month's free song is The Bird. You can download the song and also print the song sheet. This month's song is a dreamy reflection on the cyclical nature of day and night, dark and light, sunrise and sunset -- and a reminder that there's a little dawn bird singing in each of our hearts, showing us the way to the morning. It's called The Bird. We hope it sings to you! While you're at Charity and the JAMband's site, be sure to listen to other songs and watch some of their videos. Your little ones will be dancing and singing in no time. I'm hoping that next month's free download is Peanut Butter and Jam. Which song would you like to download?